'02 Winnie Journey DL has an air actuated step well cover that has failed on me and I hope that someone here has had the same problem and might give me some advice on what to look for. What happened is that it was working fine, until it just stopped. No odd behavior before it failed, no strange noises, it always quietly slid out, or back in, whenever the rocker switch was pressed. Flipping the Auto/Manual air control switch to manual allowed it to be opened or closed manually. Than one morning, it just failed to retract when the button was pushed. First tried operating the Auto/Manual switch to manual but that made no difference. Climbed outside and pushed on it to try and get it back into the floor housing, and it was obviously being held by air. Eventually discovered that I could drain the air tank when the engine is off and the step would slide back into the floor. Tested the rocker switch and it was showing a higher than normal resistance so replaced it with a new switch. No change. Removed and inspected the Auto/Manual valve and it looks fine, no air leaks I could see, reinstalled but no change. After I've been parked for awhile, the cover can be slid out or in, and it stays in that position when I start the engine. But once the rig has aired up, then it's stuck in the last position it was in and operating the switch has no effect. I've looked at the drawings but they don't seem to help much. Where are the relays for instance? Anyone worked on this issue and could give me some insight on what to look for...and where to look? '02 Winnebago Journey DL, DSDP, 36' of fun. Well, Pete, by the looks of it, we are on our own. I'll come back and post a fix if I find it. Oh, wait, it's only been a day since I posted this...jumping the gun a little. Maybe someone with expirience with the issue will wander by and see it during the winter vacation period, after their family has all left for home? Search this forum, Step Well Cover Problems. You. Will find many posts. Since it suddenly stopped working the first thing I'd do is crawl under that area and look for a lose wire or a bad/rusty ground. While I was under there I'd look for maybe something lodged in the moving mechanisms. I'd also lube all those moving parts too to remove any resistance that could be popping a fuse. Than I'd check the fuse. If those didn't produce any results I'd dig deeper. Making Traveling, FTing and Our Motorhome "GREAT AGAIN". Yeah, looks like that's what I'll have to do. And thanks for the advice. I did a search as a previous poster suggested but there were too many where the mechanism is electric whereas mine is air. Or their symptoms were too far different from mine. Didn't find much help there except for learning how to get the platform removed...perhaps. I'll know when I give it a try here soon. Call Winnebago and ask if they have diagrams of the step slide system and the locations of control relays. I needed one for my rear slide to adjust it and they emailed them to me. Their very helpful. Good luck. Have you checked the front 12 volt D.C. Panel? You'll find both cb's and control relays. However, you said the manual over ride doesn't work so it sounds like an air valve failure. This happened on my 2002 Horizon TD. I found the switch was bad. The step in/out pneumatic system consists of the switch and a 2-way latching solenoid/plunger type pneumatic actuator. 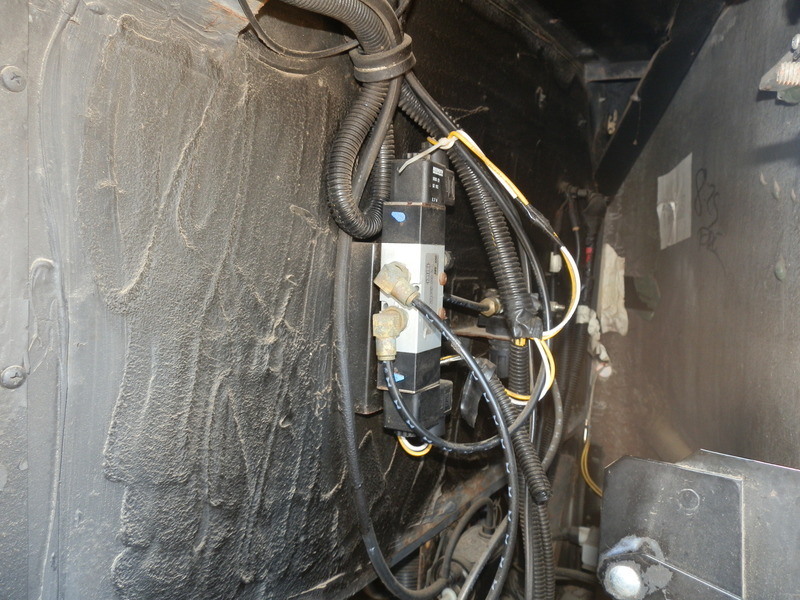 Look under the "hood" on the drivers side for a device about 6 or 8 inches long mounted to the "firewall" with a couple of 1/4" air hoses and a couple wires going to it. There are a couple of manual actuation buttons on the pneumatic switch that will allow you to move the step cover (make sure you have system air pressure). I would remove the switch panel to get at the switch connections and check the switch operation. As I recall the switch is a momentary double throw single pole switch. The center had 12 volts and the other 2 connections went to the pneumatic actuator. Test by jumping between the center and either of the other 2 poles. If you can make the step work by jumping the connections the switch is bad. I found a replacement at a local electronic supply house. BTW, I at first suspected that the pneumatic actuator was bad and after pricing it decided to look elsewhere for a failure. As I recall that bad boy was close to $100. I already tested and found that the rocker switch had a higher than normal resistance in one position so I replaced it. No change in symptoms. I'll check for that under hood device tomorrow. Thanks! When you replaced the switch did you happen to check for 12 volts to the switch? Checked for 12 Volt and found it on the switch. Operated the switch while trying to listen for solenoids clacking but I'm so hard of hearing now, I couldn't detect any. Now I am at a RV park where there are lots of folk around that could listen for me, so I'll try imposing on someone to listen for me soon. See if I can localize the solenoids with help. Jim, I have a Journey exactly like yours. My cover quit and I messed around with the blue oblong switch under the hood. I pushed the little yellow button on the side of the blue switch and it caused the cover to close. It stopped again a few days later an I again pushed the yellow button and its been about 2 months and I haven't had any more problems. Don't know what I did. So during testing, after I ran the engine to get air pressure up to 110 PSI, I found that the little blue buttons extend and retract the cover without a problem. Then the passengers switch will retract it but not extend it. So the EXTEND solenoid is either bad, or not getting voltage. I should have a solution here soon, after more testing.